Jack - Just Another Chess Calendar. You can add an event and it will be immediately visible online! In association with Amazon, the greatest library on the net, La Mecca - Chess Encyclopedia can offer all of your favorite chess books, from their incredible catalog. Welcome to La Mecca, the first real Encyclopedia of Chess on Internet. 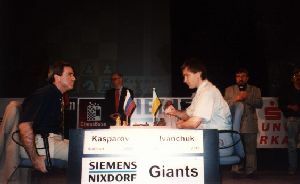 In this site you find a lot of information about chess, chess players (images, biographies, ecc. ), chess events (tournament tables), Elo lists and calculation, ECO codes and, of course, thousands of links to best chess sites all over the world. A comprehensive guide to all major chess figures, with a lot of biographical data and images. A complete guide to all major chess events, with a lot of tournaments tables, news and images. A guide to all major chess events, ordered by date. What's happened today in the chess history? Jack is an International Chess Calendar and it's a self made chess players service. You can add/modify/delete chess events of every type (tournaments, congress, lessons, online event, and so on) and they will be immediately visible online! Use of Jack is free for everyone! Welcome to Clink!, probably the greatest collection of chess links on the net. You can add your favourite chess site and suggest new categories. A speedy method to search in our links database. This is a list of more than 2,000 opening codes. You can easily search your favourite opening and also see the position diagram. You can also download all openings codes. You can view all moves of each opening code with a fine Java interface. With these pages you can calculate ELO rating for some countries. Please, send me ELO rules for your country: I'll create a page for you! My name is Maurizio Mascheroni (nickname maskeret) and I'm an Italian chess player and tournaments director. I have made this site to help chess players all over the world. I hope you enjoy my work. If you want to add or change the information about a player (for Who is Who section), you can compile this form. If your site is linked by La Mecca you are a Member of Chess Encyclopedia. Congratulations! Your support is greatly appreciated, and I hope you will link La Mecca on your site (I've also a page for banners exchange). If you want, you can follow the instructions provided in the Members page. For everything you can contact me. Thanks! The instructions to provide a link to this site from your site, with some banners to download. The official site of the premier italian magazine. The portal for all chess events in Italy. One of the best chess shop in Italy.